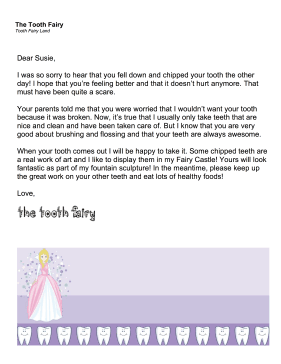 Great for soothing fear, this printable tooth fairy letter assures a child that chipped tooth will still be traded for money. I was so sorry to hear that you fell down and chipped your tooth the other day! I hope that you're feeling better and that it doesn't hurt anymore. That must have been quite a scare. Your parents told me that you were worried that I wouldn't want your tooth because it was broken. Now, it's true that I usually only take teeth that are nice and clean and have been taken care of. But I know that you are very good about brushing and flossing and that your teeth are always awesome. When your tooth comes out I will be happy to take it. Some chipped teeth are a real work of art and I like to display them in my Fairy Castle! Yours will look fantastic as part of my fountain sculpture! In the meantime, please keep up the great work on your other teeth and eat lots of healthy foods!